Occupy protests took a dangerous turn this weekend when three protesters, one of them pregnant, were hit by a car in DC. A 78-year-old woman was also hurt when she was caught between protesters and police. Clare O'Connor of Forbes was in DC on Friday, where "America's richest brothers" David and Charles Koch were backing a summit for the conservative Americans for Prosperity Foundation (at the summit, Cain called himself "the Koch brothers' brother from another mother"). O'Connor writes that Occupy protesters soon surrounded the convention center where the summit was held, "trapping AFP guests inside, eventually causing at least two injuries to elderly attendees who tried to leave and were shoved down a set of stairs." She adds that she watched an elderly woman "hit her head after finding herself accidentally caught up in a scuffle between protesters and the police." The Telegraph identifies the woman as 78-year-old Dolores Broderick, who was later treated for "a bloody nose and bruises on her hand and leg." Much coverage of the event, including the video at left, accuses protesters of "pushing" Broderick down the stairs, but it's hard to tell from the video how she was actually hurt or whether anyone assaulted her. 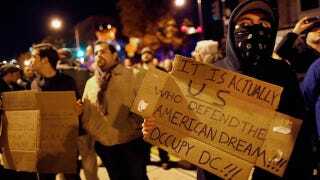 I've reached out to both Occupy DC and the DC Metropolitan Police Department for more information. Also controversial was the collision between three Occupy protesters and a car outside the convention center. O'Connor reports that the protesters set up makeshift blockades on streets surrounding the center. One driver, identified as Shawn Valentine, plowed through the blockade, injuring protester Heidi Sippel, her thirteen-year-old son, and her wife Brandy Sippel, who is three months pregnant. According to Occupy, he also hit a fourth victim who is still hospitalized. Police did not charge the driver — Lt Christopher Micciche says the Sippels "either ran toward or jumped in front of the moving vehicle." He adds that "it was essentially an accident where three individuals were injured but they were in violation by being in the roadway." The Sippels, meanwhile, say they were charged with a traffic violation and fined. He just threw his hands up and hit the gas. We weren't trying to get in front of the cars. We would have very happily, given the opportunity, stepped out of the way and let him pass by. Upon seeing the driver let free, a few dozen protesters flooded back into the street to protest this miscarriage of justice. At that point the police began tackling protesters, shoving two into the ground and cuffing them. They also tackled a random person biking by, and arrested him. It's still unclear whether Occupy protesters bear responsibility for injuring Broderick, and the question of whether blocking roadways qualifies as peaceful protesting may be a matter of debate — though Sippel maintains that police were in fact blocking roadways and protesters were merely serving "as a visual" for summit attendees. But in any case, citing the victims of a car collision but not the driver sends the message that police don't care about the safety of protesters. This is a big problem — protesters have long questioned whether they can rely on police for protection in dangerous situations, and unless Metro PD changes its tune on the Sippel collision, many DC Occupiers will likely conclude that the answer is no. And this isn't just an ideological issue — Occupy protesters face all the dangers other citizens face, and they deserve access to all the resources other citizens have, including police protection. Occupy protests have often shown the ability to care for their own (an Occupy Vancouver medical team saved a man from a drug overdose last week, though they were unable to save a young woman who died suddenly of unknown causes), but that's not the point. The right to peaceful protest is enshrined in the Constitution, and that includes the right to be safe while doing it. If police start to ignore this right, they drive the already deep divisions in this country even deeper.